Combination of seasonal fresh flowers. Nice and bright. 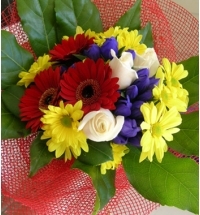 Roses, Gerberas, Daisies, Gentians wrapped in beautiful netting. Medium shown.